Normally, a cat that is housed exclusively indoors and under the influence of seasonal light (the sun) will not have estrus cycles during the Winter months, especially November and December when daylight hours are shorter. With the onset of an increase of sunlight during the day, female cats will start their estrus cycles again. This is why more kittens are born in the late Spring than any other time of the year. An intact female cat is called a "Queen." There is some evidence that longhair cats are more sensitive to the amount of daylight and that only about 10% of longhair cats show regular estrus cycles during the breeding season. Conversely, about 60% of shorthair cats will show regular cycles during the same breeding season, and over 50% of shorthair cats will cycle year round. Additionally, cats housed where they get a minimum of ten hours of artificial sunlight (through artificial sun lights) each day may cycle year round. Conversely, cats that are kept in rooms without a minimum of eight hours of sunlight (through the windows or artificial sunlight) will virtually stop cycling. Proestrus: The female is attracted to the male (and visa-versa), but unwilling to mate and will actively discourage the male cat. Usually, this stage lasts 1-2 days. Many Queens can be nursing kittens and enter another breeding cycle as early as 4-8 weeks after the kittens are born. Just like with humans, nursing Queens CAN GET PREGNANT! It is possible for people to confuse the signs of the feline estrus phase with signs of being in pain. Rest assured, they are NOT in pain. The average length of estrus is about one week, but cats can be in estrus for up to two weeks or as short as three days. However, keep in mind that if a cat is bred on the first day of estrus and through her complete cycle that could last 14 days, the resulting litter (the younger ones at the end of estrus cycle) may not live as their lungs would not be sufficiently developed to pass air. 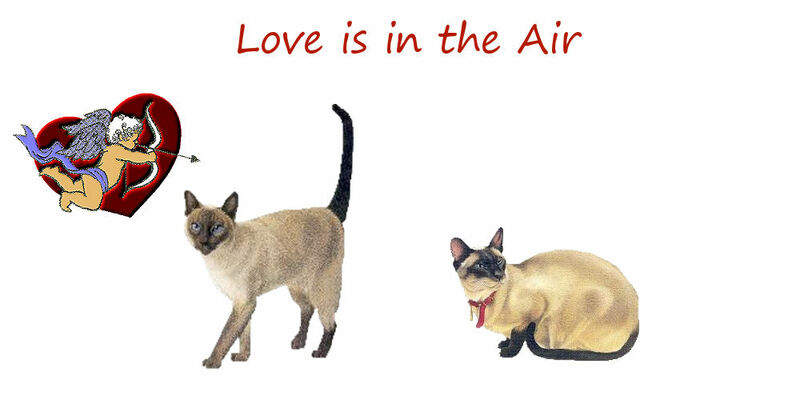 A full-term kitten's lungs produce "surfactant" which lubricates the lining of the air sacs within the lungs allowing the inner surfaces of the air sacs to slide against one another without sticking during breathing. Premature kittens sometimes do not have surfactant, and the kittens will die due to respiratory failure because their lungs do not work correctly. If a Queen is not bred during estrus, she will most likely go back into heat within a few days to four weeks. Inerestrus: The period of time between estrus cycles, if the cat is not bred it is about 2-3 weeks. Metestrus (or Diestrus): The period after estrus (or mating) is about 30-40 days. If the cat is pregnant, they will deliver their kittens in approximately 65 days from the first day that she mated with the stud cat. Anestrus: The time of inactivity between the estrus phases which can be on average 2-3 months (if not bred or pregnant). Cats are "induced ovulators" which means that they can only ovulate (release an egg from the ovary) if mated (or similarly stimulated). 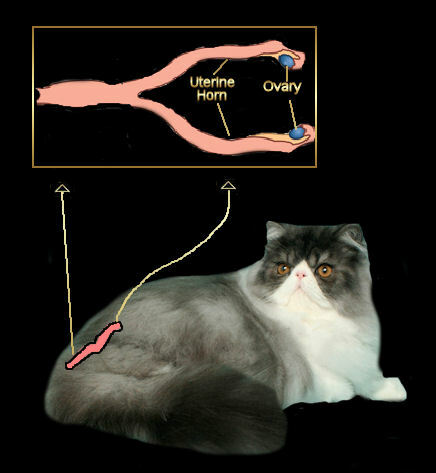 Additional ovulations occur with multiple matings by the intact male cat which is why you get more than one kitten. It is possible for more than one male cat to breed the same female cat and sire kittens. If the breeder or owner feels this happened, then a DNA test can be performed on the kittens (and the suspected sires) to determine paternity. Only then can the kittens be registered with The Cat Fanciers' Association (CFA). The DNA test is a buccal swab – using a Q-Tip to collect saliva and skin cells from the mouth. The University of Davis in California can perform these types of DNA Tests. A female cat has two uterine horns in which the kittens develop like little peas in a pod. As both a breeder and show enthusiast with over 35+ years' experience showing and breeding, first German Shepherd Dogs and now Persian cats, I have heard it all from my potential puppy and kitten buyers. The most often heard reason for not spaying a female pet is that they want their children to "experience the miracle of birth." This is NOT a reason for putting your pet's life at risk! Show your child a video on YouTube, DO NOT BREED YOUR PET or you risk losing that pet and the babies during the birthing process. Every time you breed your cat and pregnancy results, you are putting that cat's life and the kittens at risk. When a human gets pregnant with multiple babies it is considered a "high-risk pregnancy," so why do we think that it is any different in our household pets? It is not unusual to lose kittens at birth due to complications. Below is a great educational video showing a cat giving birth – be warned, it is graphic and may not be suitable for children. As you can see from the video, the 4th and final kitten born did not make it. This is the reality of cats and dogs when they have their babies. DEATH. It is something we all face as breeders, and it is heartbreaking. Reduce the risk of accidental pregnancy and thereby contributing to the over-population of cats. Reduce the chances of reproductive diseases that could result in the death of the cat. Queens that have too many heat cycles without getting pregnant can get a uterine infection called Pyometra which can be life-threatening. A cat can be spayed while pregnant.